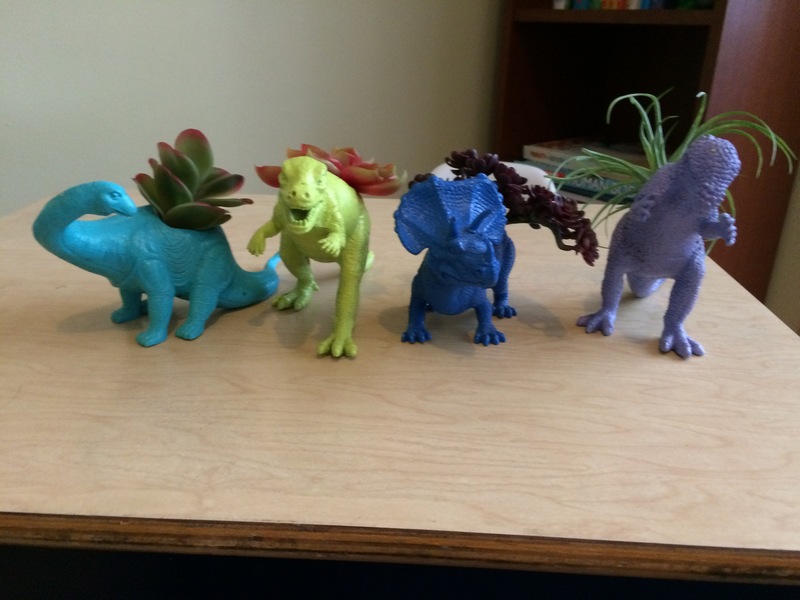 I wanted to do a quick post on some of the dinosaur accents throughout the room because they are all so adorable. 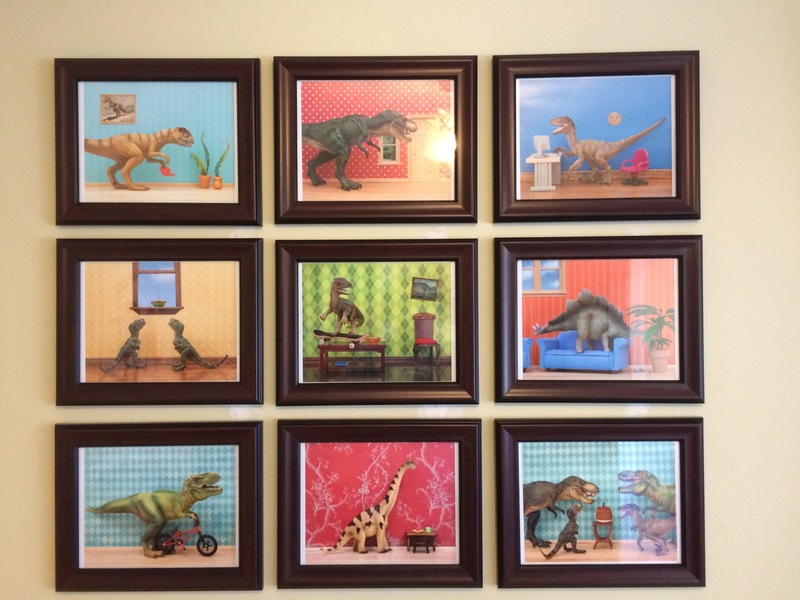 I found these really great prints on Etsy from Wild Life Prints. If dinosaurs aren’t your thing, they have all kinds of animals to choose from. 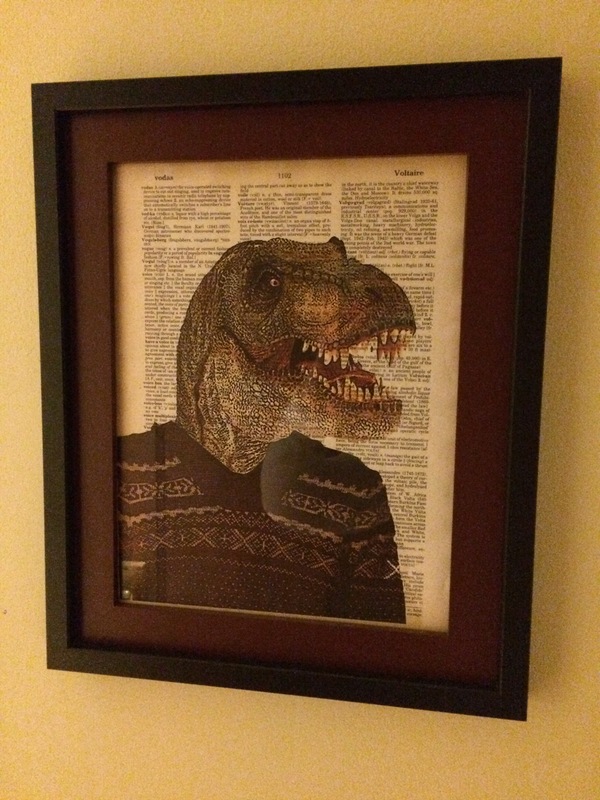 This gem of a print–a T-Rex in a Cosby sweater — is available on Etsy from CollageORama. 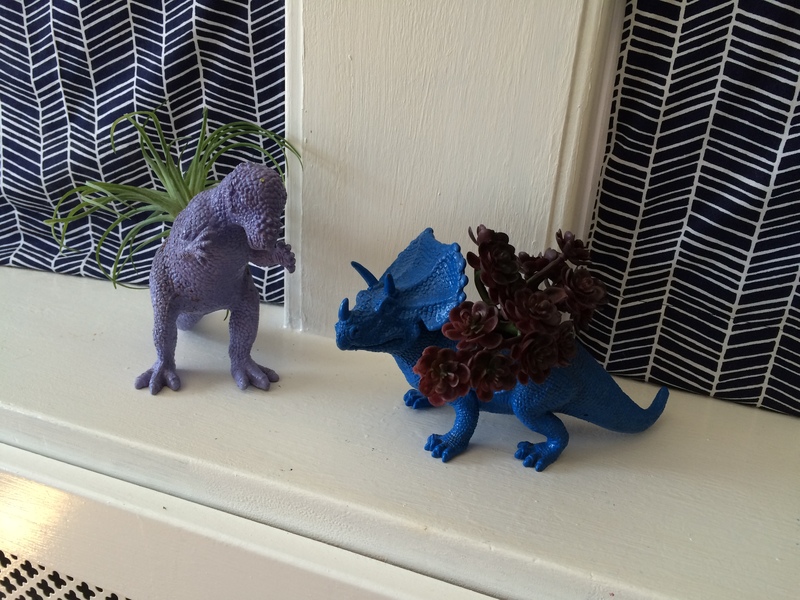 I scattered dino planters along the window ledge in the bed area. I originally planted real succulents in them and roughly four seconds later, the kids had spread dirt all over the room. Andy said, “I feel like that’s on you.” Fair enough. Now they are dirt-free and planted with plastic succulents. 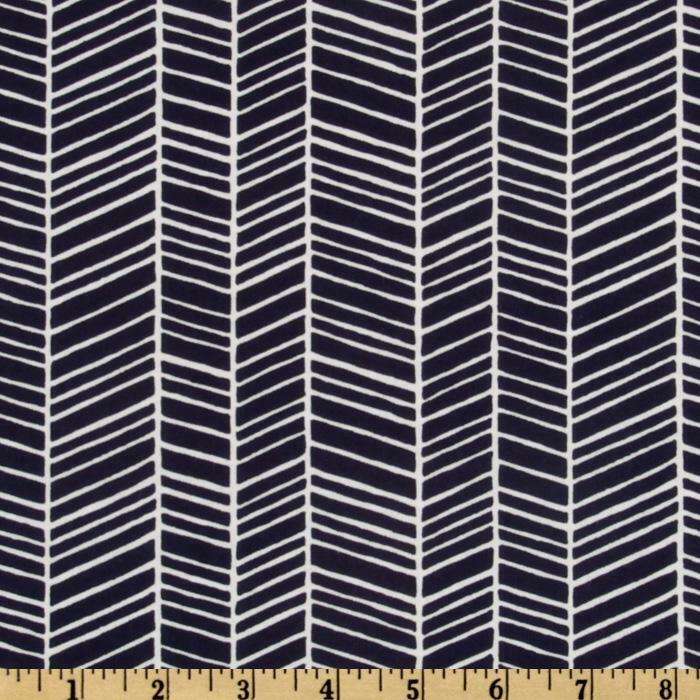 I would also like to note that when I purchased these on Etsy from Crazy Couture, both my husband and my mom scoffed that we could have made them ourselves. Probably. But sometimes you just need to make purchases to forward the plot. Worth it. 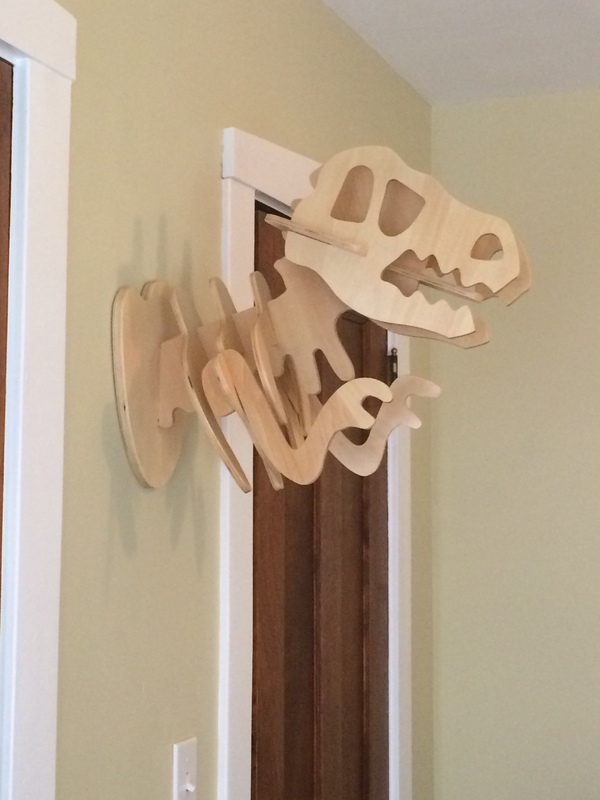 This awesome mounted T-Rex fossil is the view from the bed. It was a gift from the grandparents. I believe it came from Pottery Barn Kids, but I don’t think it’s available anymore. 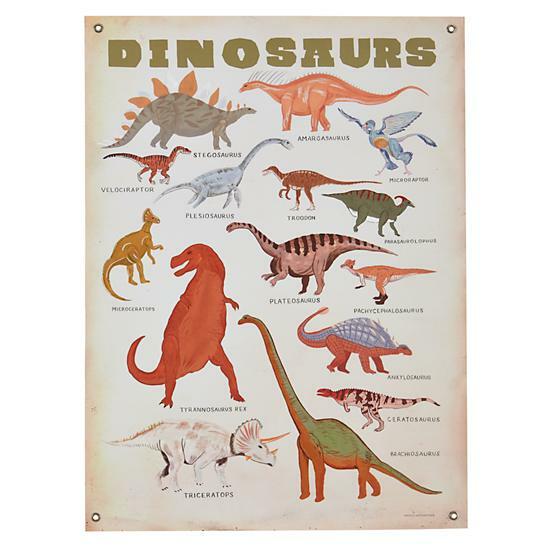 This Paleontology 101 Banner came from The Land of Nod. 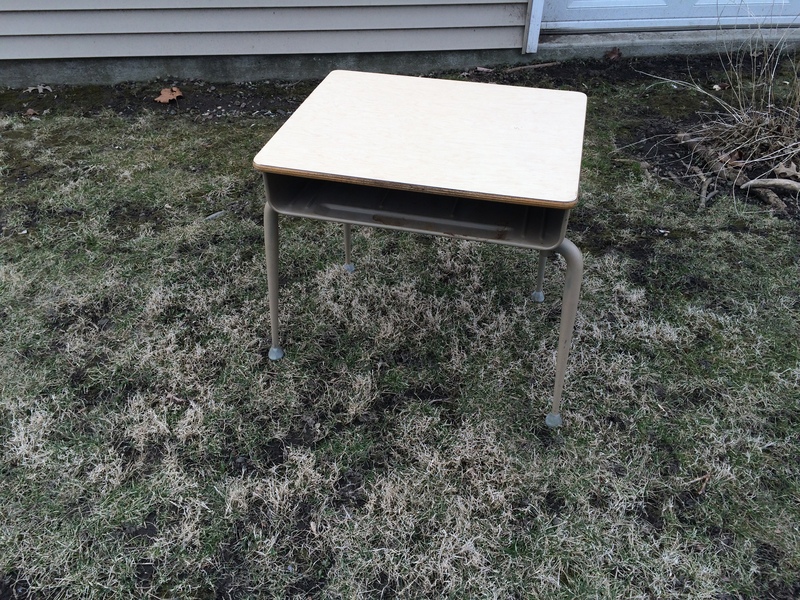 I found this vintage school desk for my 5-year-old son’s room on local Etsy.com. 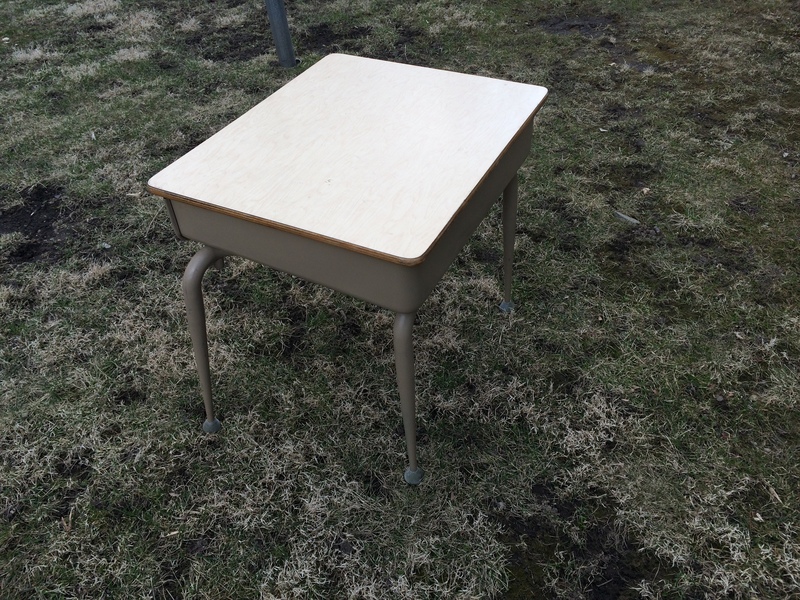 It was in very good condition, but in need of some sprucing. 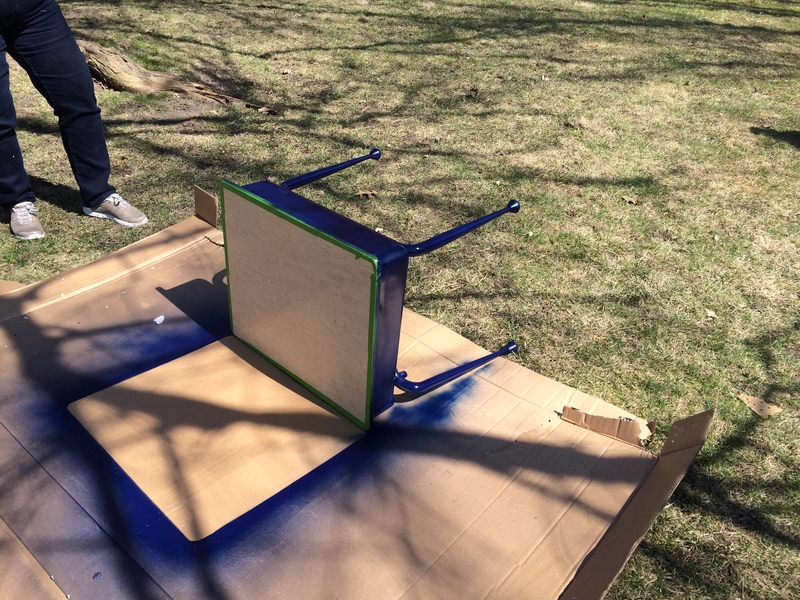 We wrapped the edge of the desktop with painter’s tape to protect it from the spray paint. 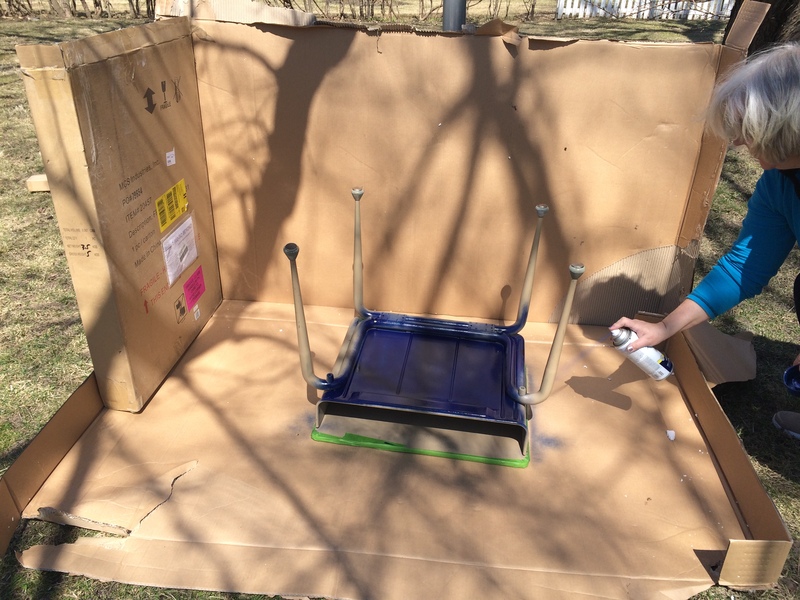 We created a makeshift spray booth out of cardboard boxes and went to town with navy Rustoleum spray paint. 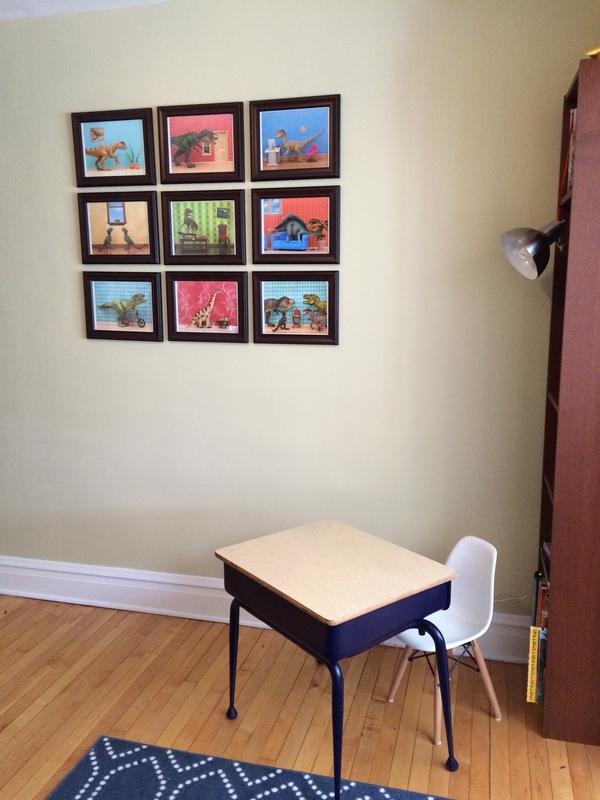 It’s just the right size for him, and he likes having a play and homework surface in his room. I like that the Play-Doh goes on the desk rather than in his bed. Sometimes. Like half the time. Thirty percent of the time, Play-Doh doesn’t end up in the bed. I take my victories where I can get them. 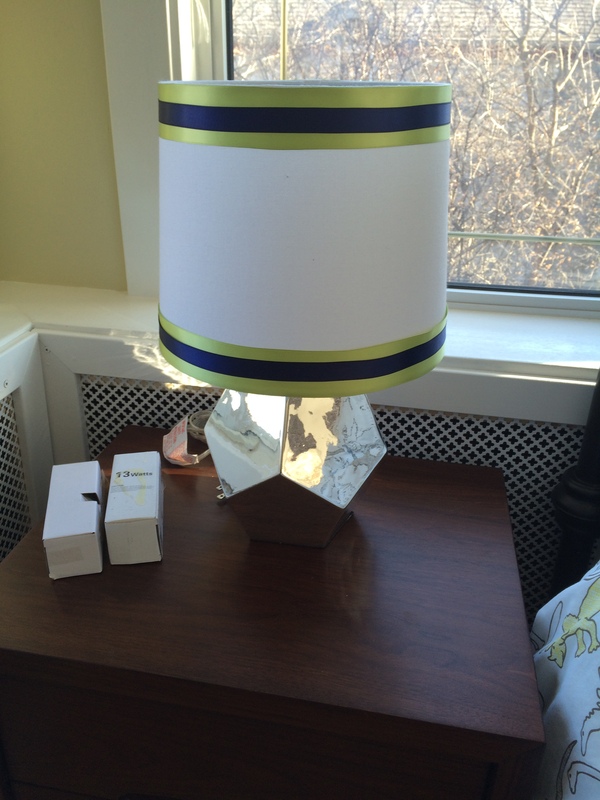 I found these lamps for super cheap at the outlet. Fine, right? But ultimately just fine. 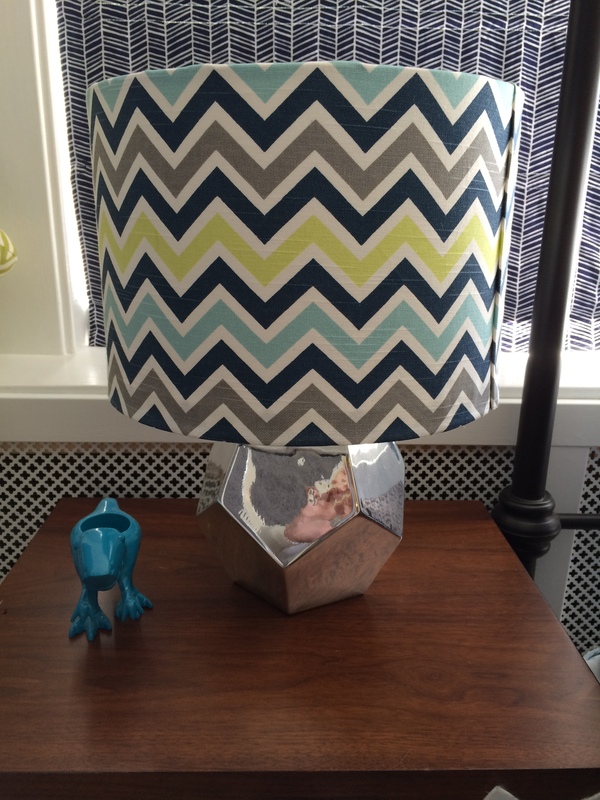 It seemed too boring for an otherwise really fun room, so I abandoned that idea and found a chevron fabric in the same color scheme. 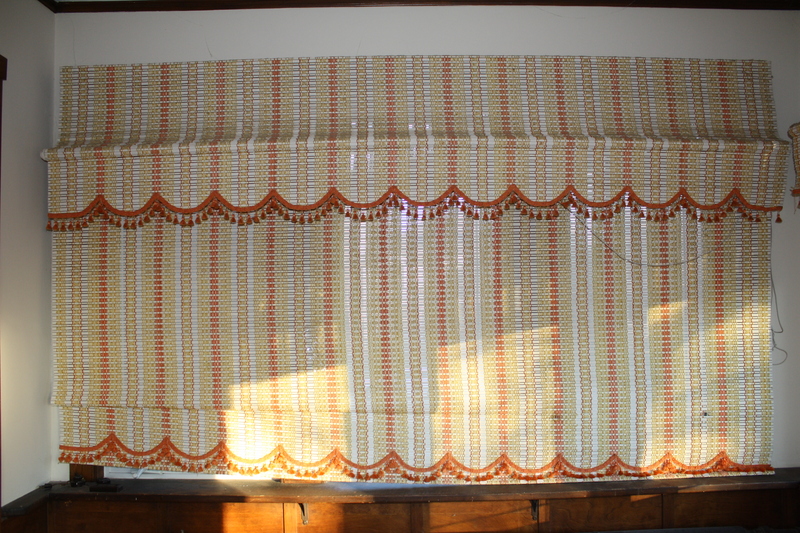 My mom used fabric spray on the shade and wrapped the fabric around, tucking the top and bottom into the inside of the shade. 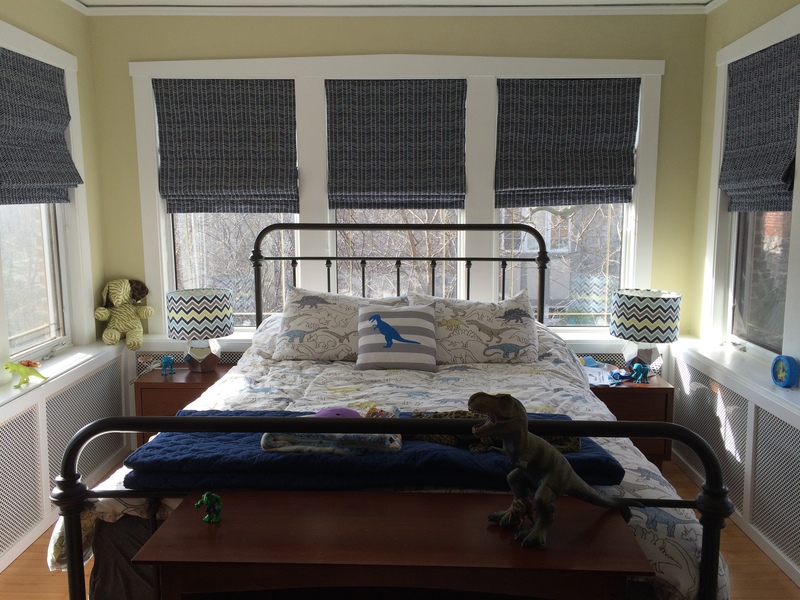 Our son, amateur paleontologist that he is, wanted a dinosaur-themed room. I was on board with that, but stayed classic with the fixed elements so that I can update the accessories as he grows without having to repaint or replace the curtains. 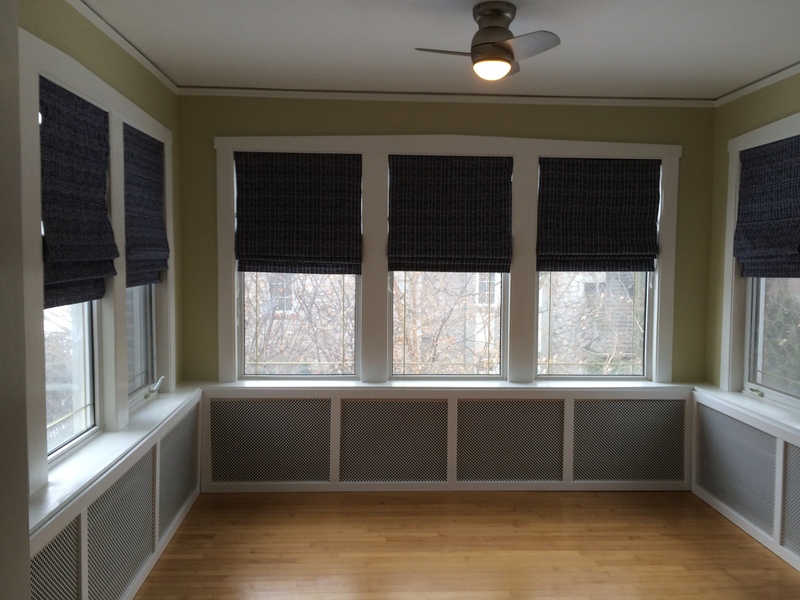 We chose white for the trim, a light green for the walls (Benjamin Moore Mellowed Ivory), and a navy herringbone for the Roman shades. Next step was the bed. We were upgrading to a queen-sized bed for him, and it was hard to find one that was appropriately scaled. 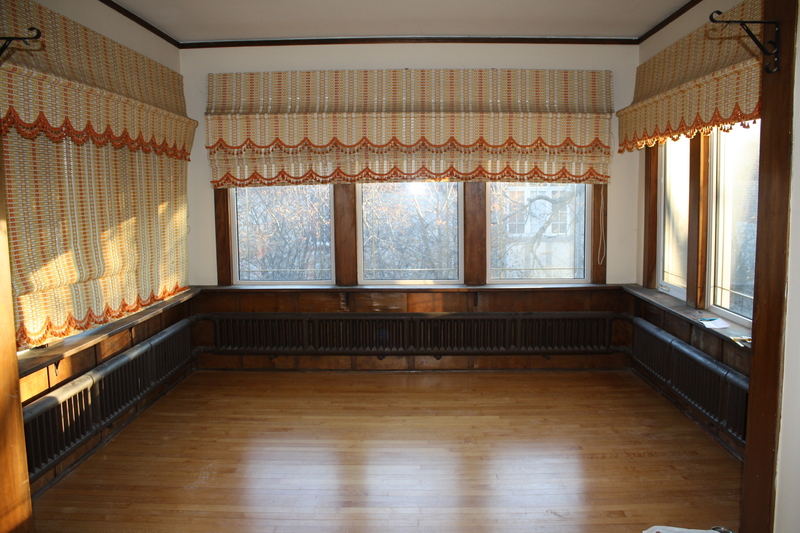 A traditional fabric or wood headboard would have looked too heavy and would have obscured the light from the windows. So I went with this iron bed I found on Wayfair.com. 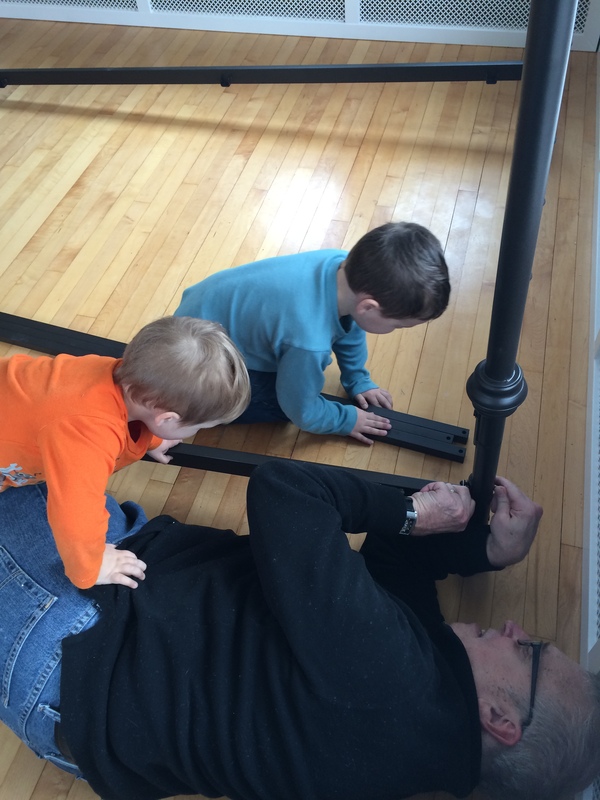 Here’s a photo of my poor dad assembling it with “help” from the boys. 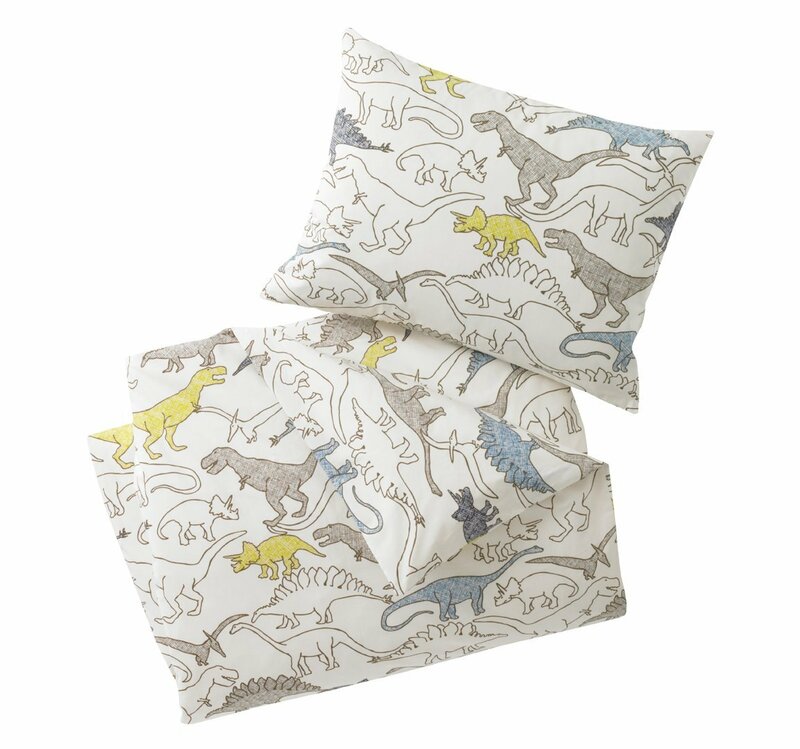 My son chose Dwell Studio dinosaur bedding, which I paired with a navy moving blanket from The Land of Nod, and a throw pillow from Etsy. 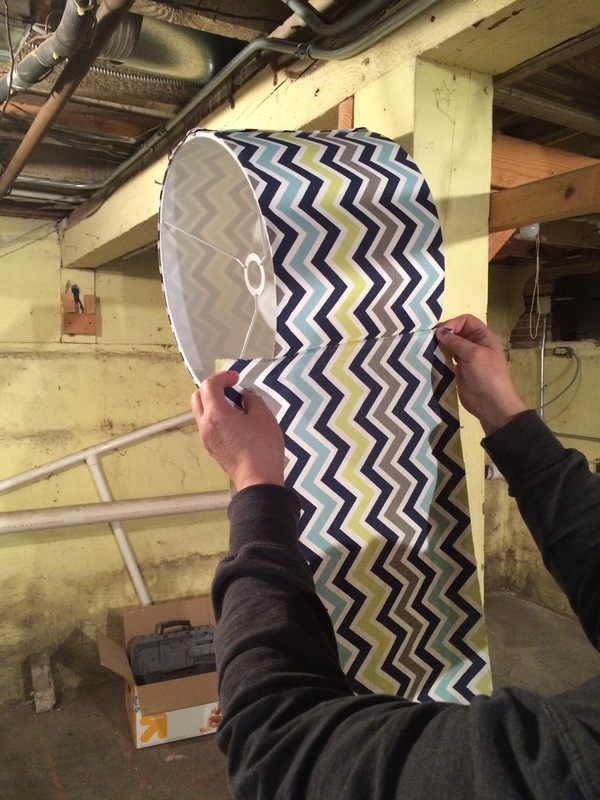 I looked into purchasing Roman shades and nearly passed away when I priced them out for nine individual windows. It was ridiculously expensive. So my mom offered to make them. 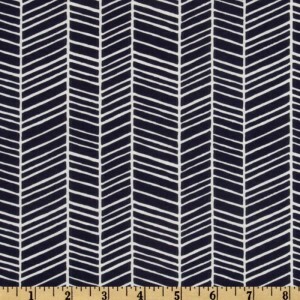 We chose this herringbone pattern from the Joel Dewberry Modern Meadow collection. She looked up instructions online and set to work. 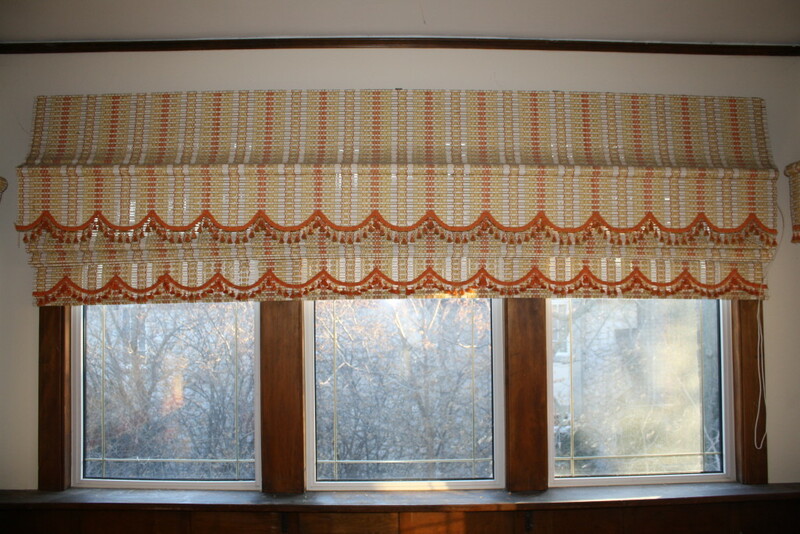 She’s a handy lady and quite the seamstress, but I think she would describe this as one of the most frustrating home improvement projects she has ever undertaken, and has vowed to never attempt a Roman shade again. 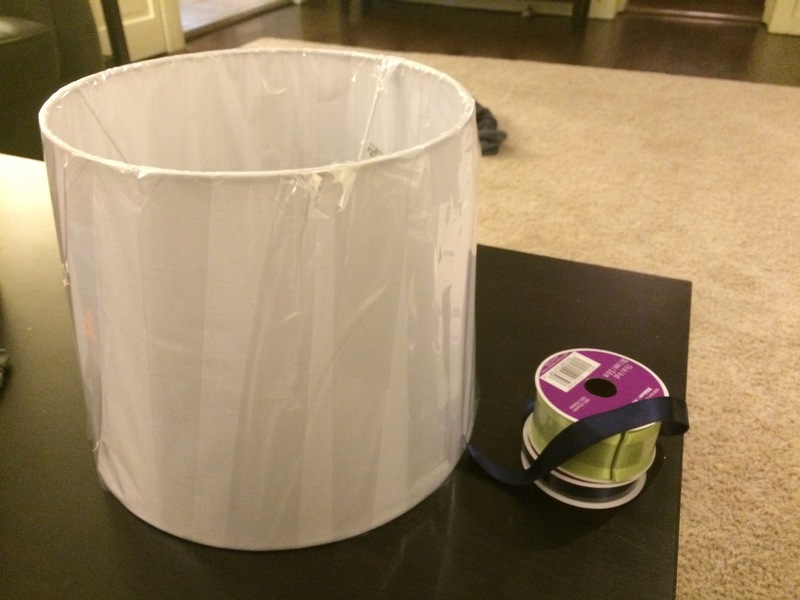 (For that reason, I am not posting a how-to because she was dissatisfied with the directions she found online and ended up improvising in a way that only befits an experienced sewer.) That said, they look amazing and totally professional and she saved us a ton of money. In return, we vow to never put her in a nursing home. Here’s the end result, in both open and closed positions. You can also see the small fan we installed over the bed area. 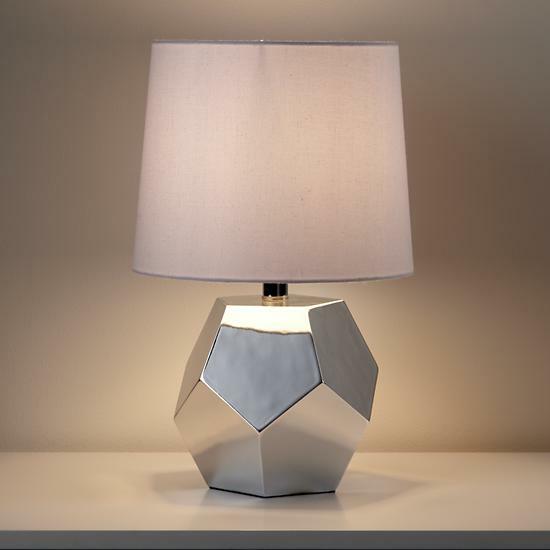 I needed a small-ish fixture, but this one was even teenier than I realized. I was feeling unsure about it until my son saw it and said, “Oh, I love the propeller light!” Done. Now I just pretend that was my plan all along. So the first thing we had to do throughout the entire house was update the wiring, which included massive tear-outs of the plaster. It was a huge mess, and we hired electricians. (Electrical work is like a siren song to Andy — he can’t resist it, and it always ends badly. So our new agreement is that we hire professionals for all electrical work. Unless he wants to up his life insurance, in which case, I’m open to it.) We also had the electricians add overhead lights to the bedrooms while they were at it. 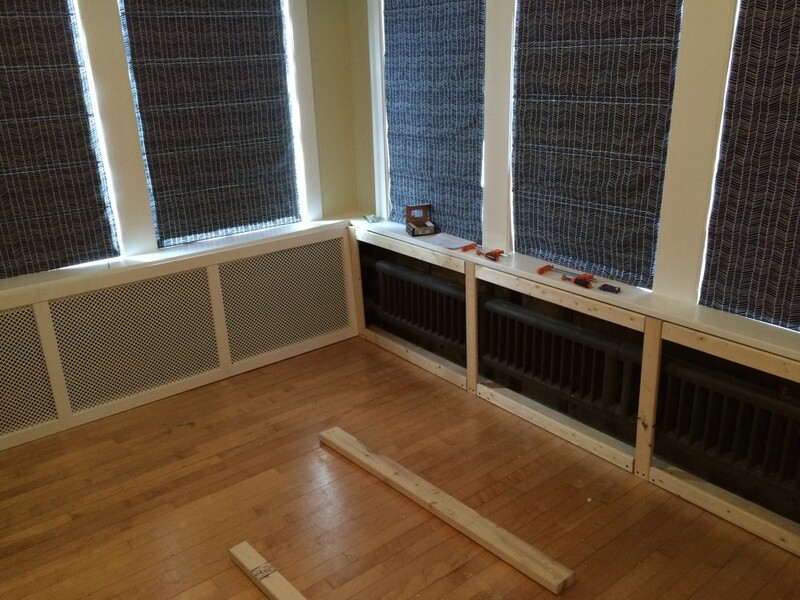 Then we had to figure out what to do about the setup of the radiators. (Pictured below). The wood was somewhat warped, and we didn’t want to leave the radiators exposed anyway because our sons don’t have any sense and would happily touch blazing sources of heat with their bare hands. Repeatedly. Andy decided to build his own radiator cover, which also meant that the only feasible thing to do was paint the woodwork. A word about that before we proceed, because I know people get really uppity about painted wood. 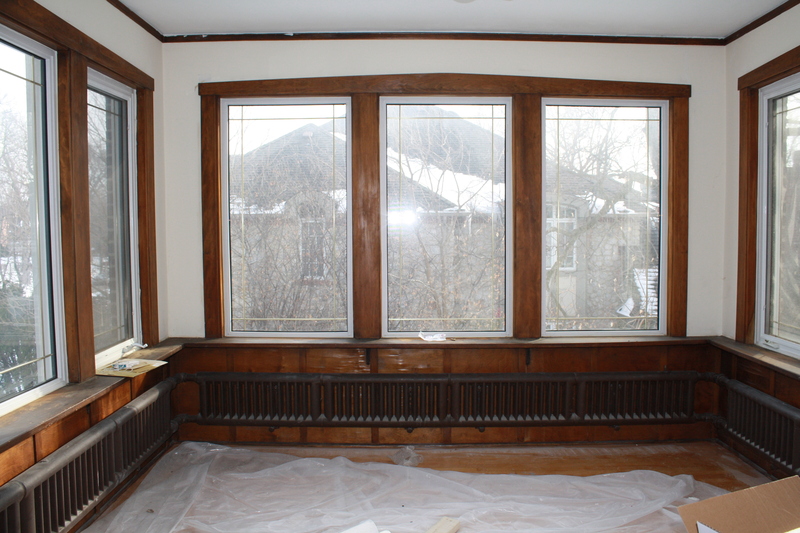 Here’s the thing: We couldn’t match the existing wood or stain to the radiator frame. 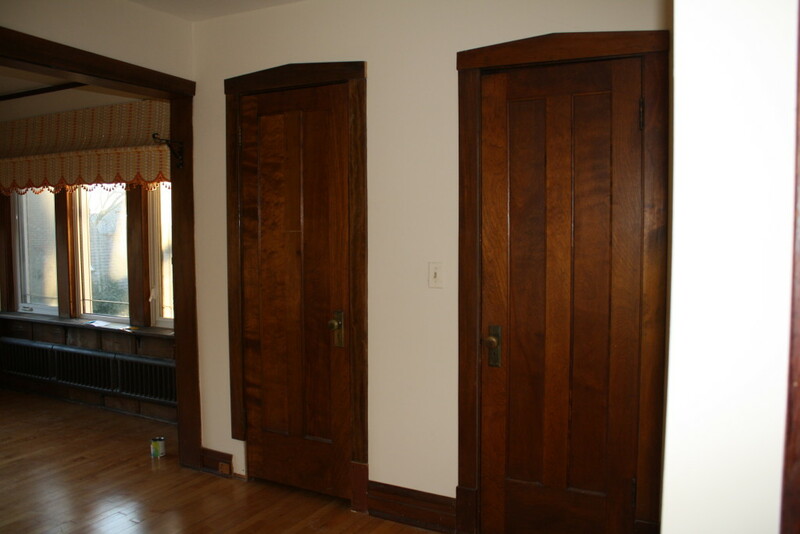 Portions of the woodwork in the room had been pieced in over the years and were comprised of different stains and varieties of wood. And white trim just looks really good. 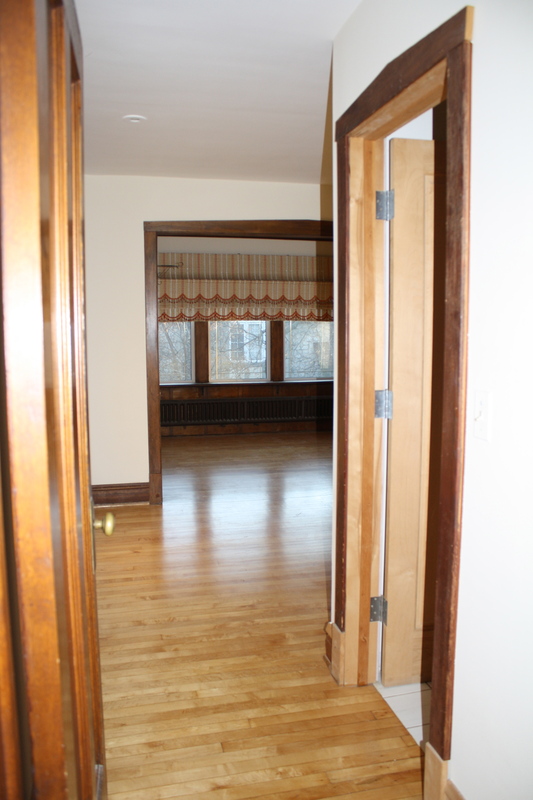 Our compromise was to leave the doors in their natural wood state, but to paint the trim. He also had to build support frames for the covers, which had to be removable so that we could access the radiators for maintenance. 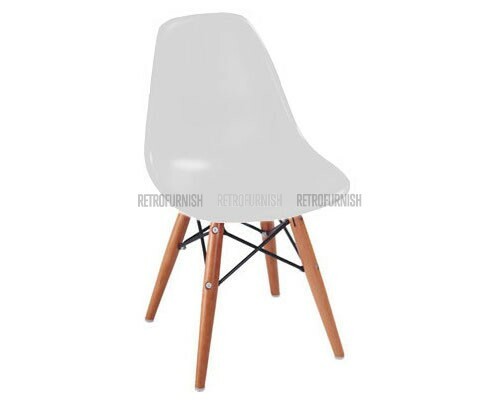 The solution was this design below. 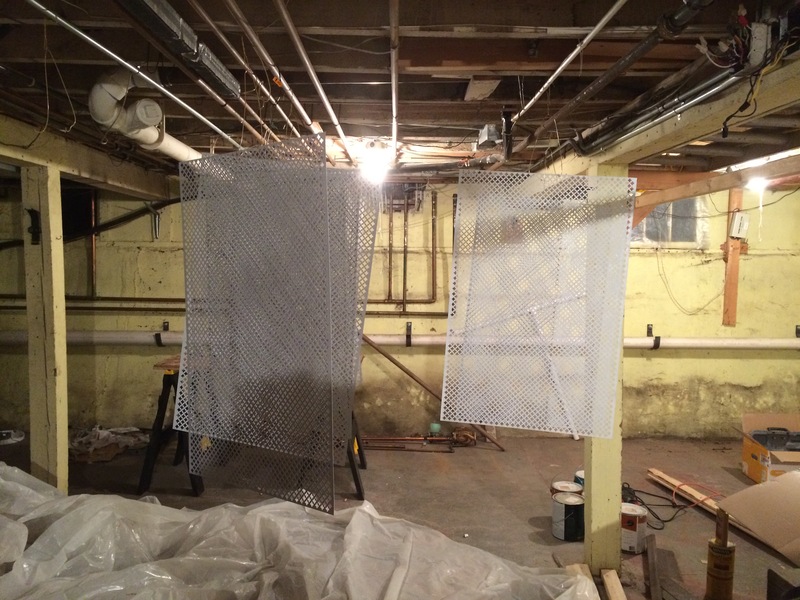 The back wall shows a completed frame; the right wall shows a frame in progress. 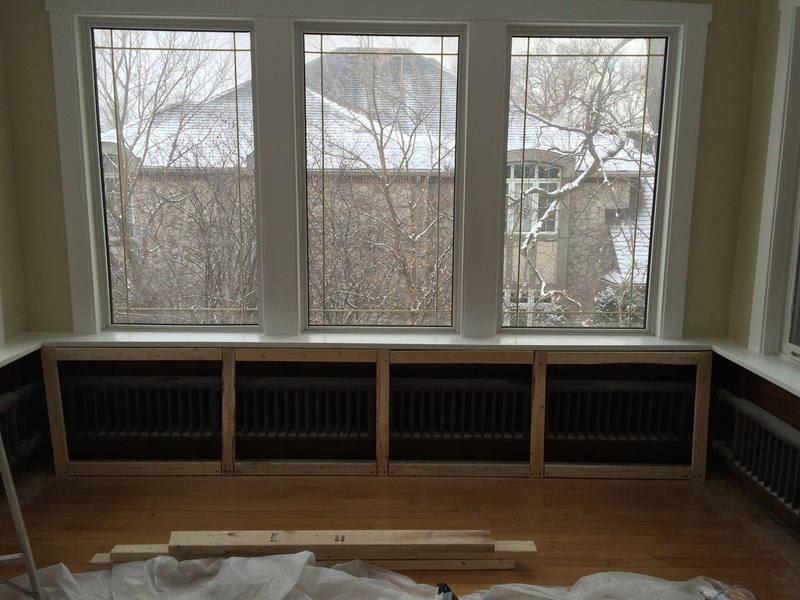 Each frame is screwed into a wooden block (there are three separate segments, one for each wall). 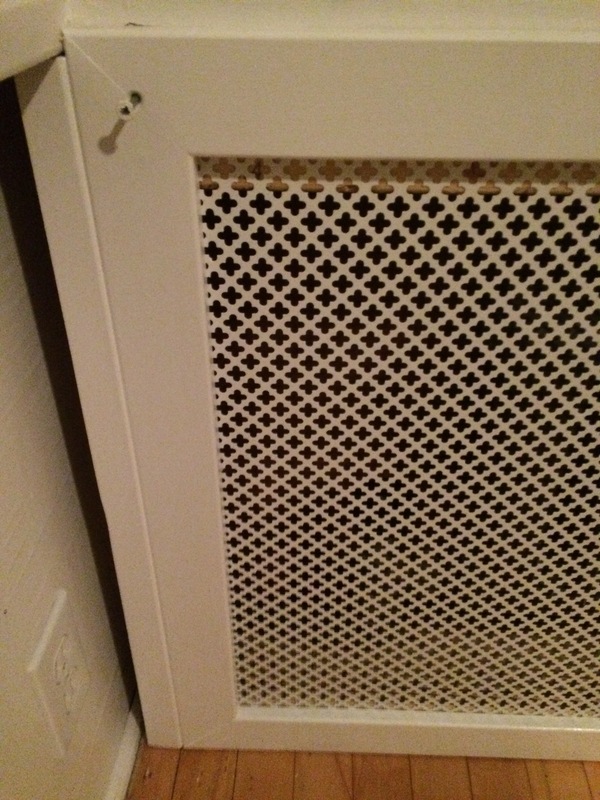 The frames can be easily popped off to access the radiators when necessary, but are screwed into the place the rest of the time. 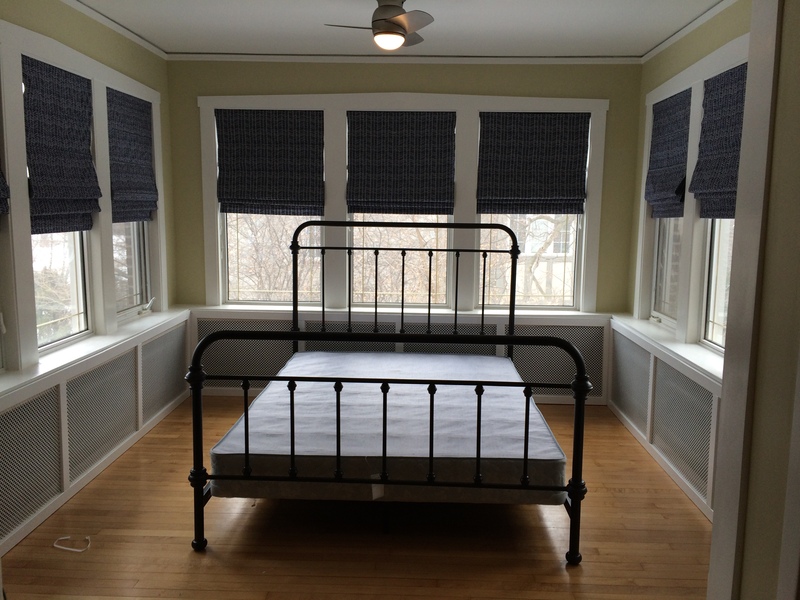 The room we designated for our older son, age 5, was the former master bedroom in the house. (The current master was the result of an addition in 1988.) 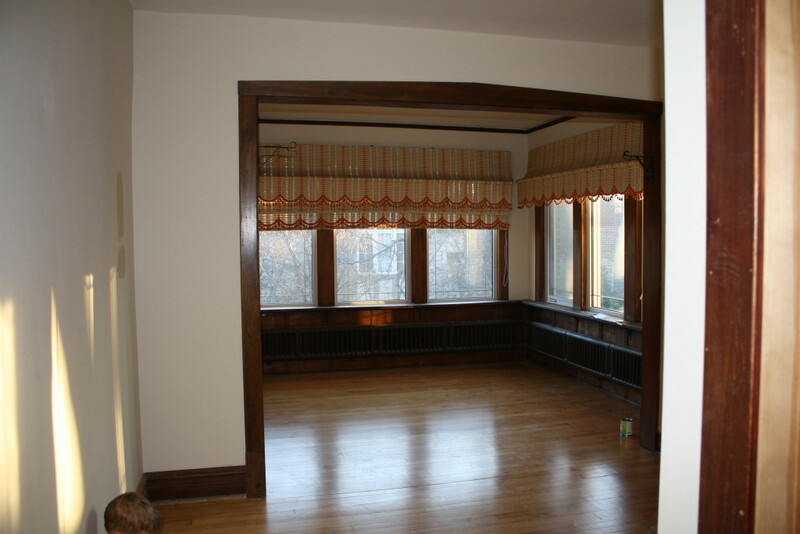 It has a lot of vintage charm, including a sun-filled room that was an addition sometime in the 1940s, plus a huge closet and an en-suite bathroom. Not a bad deal for a kindergartner. Here’s a closer view of the sleeping area. 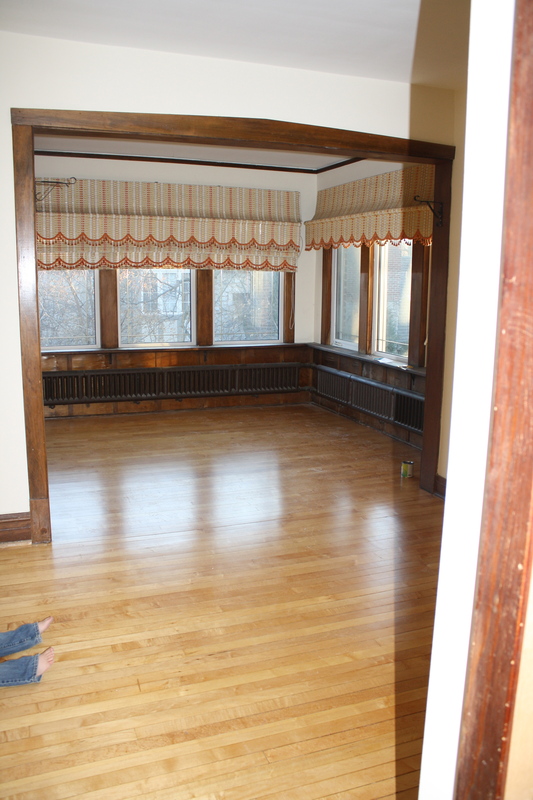 Note the vintage window dressings. We think these were from the 1950s or 1960s. They were really something. Next step? 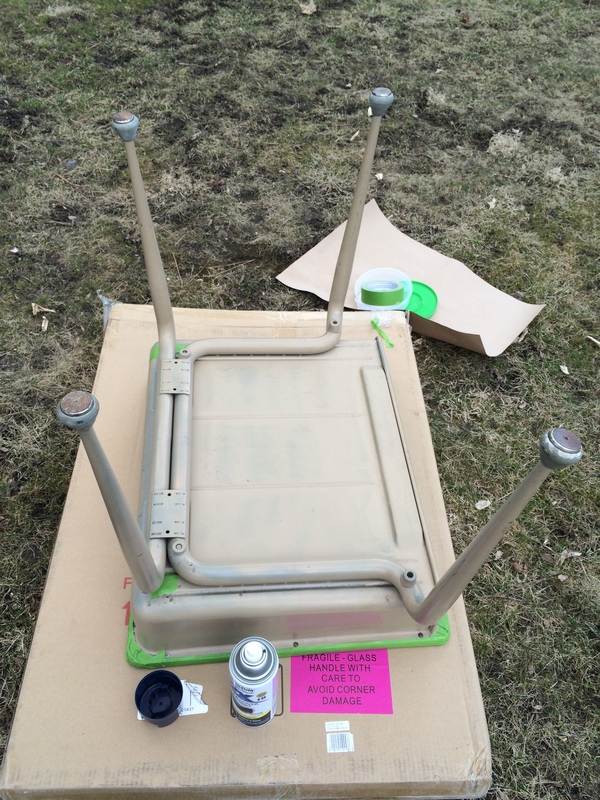 Fixing the wiring, then painting, painting and more painting. Stay tuned. It has taken a while to get this blog up and running. Our piecemeal progress does not make for dramatic HGTV reveals and is mostly determined by budget, time constraints and how long it takes to get our children to bed. Before 9 p.m.? Paint brushes all around. After 9 p.m? Our desiccated husks collapse in front of Netflix. 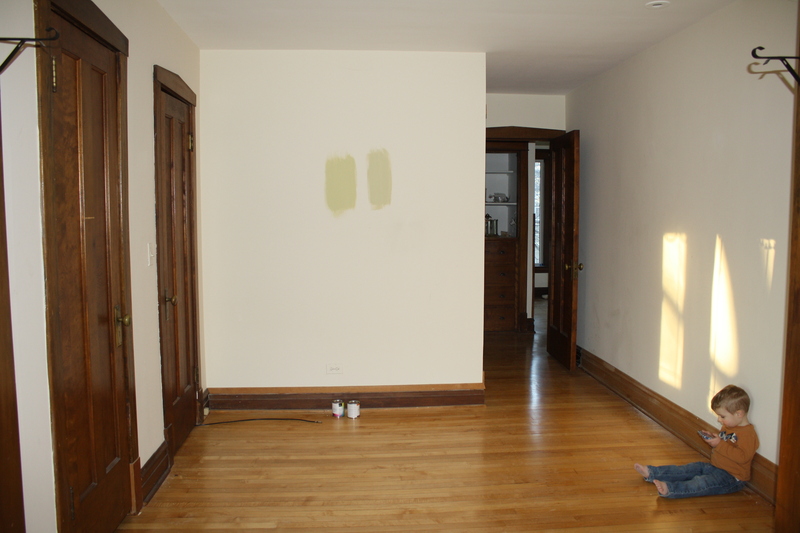 As a refresher, we bought a fixer-upper in the Chicago suburbs–an American four-square built in 1913 that underwent additions in the 1940s and in 1988. We’re trying to restore it in a historically sensitive way, and we’re doing as much of the work as possible by ourselves. You know, like Chip and Joanna. Except with a lot more swearing. Like, a LOT more. The team includes me, my husband, Andy, and my mom, Mary. We also have two young sons who “help” as well. You know, by going rogue with a paint roller or flushing sponges down the vintage plumbing. 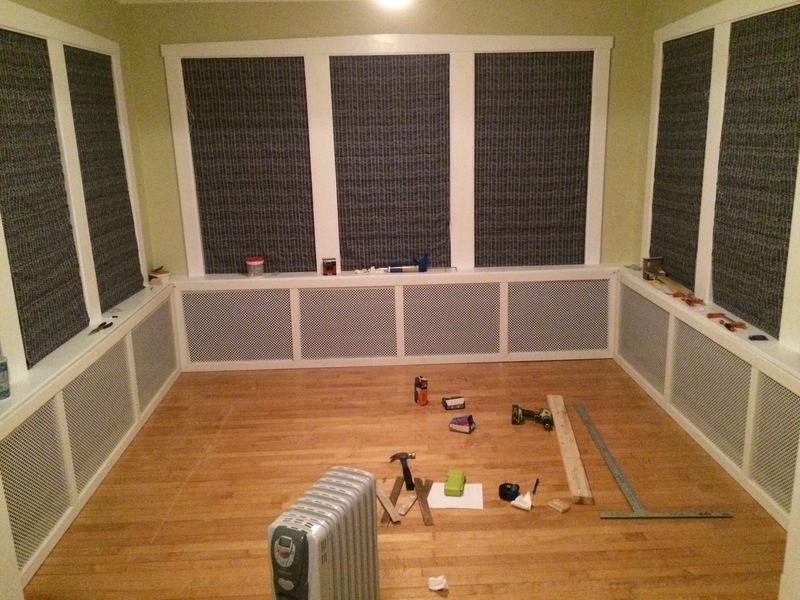 We’ve finished a handful of rooms now, and I’ll start posting the photos room by room so you can see what we’ve done and where we started.